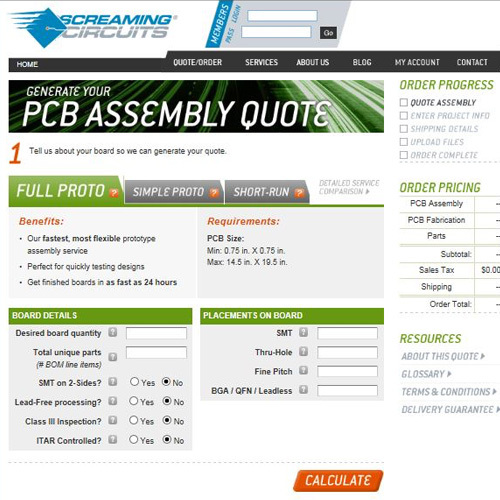 Screaming Circuits announces the creation of the first ever real-time, web-based prototype and short-run quote, purchase, and build process available in the PCB assembly industry. Customers can now automatically generate a complete quote, and place an order for a full turnkey prototype build – including the parts, PC boards and assembly. With online turnkey short-run and pilot production, www.ScreamingCircuits.com has continued to refine the EMS outsourcing services it offers as an electronics manufacturer. This service is available independent of, or as a complement to, MEC Companies’ range of electronics manufacturing services. 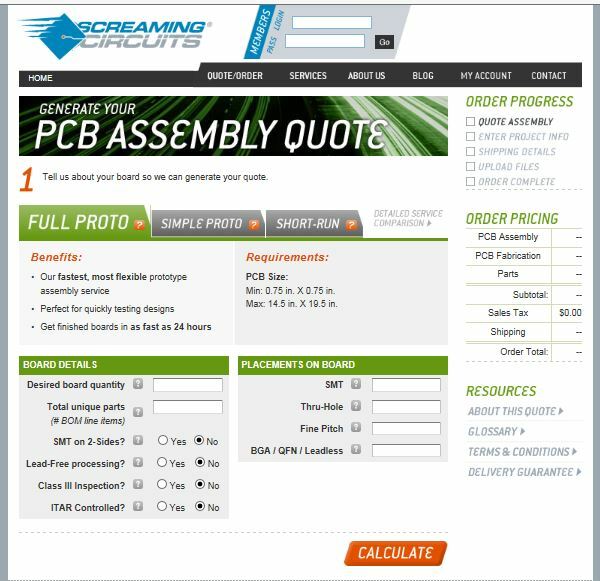 Another newly added advantage to Screaming Circuits’ online ordering is the capability to quote and order PCBexpress® Quickturn PC boards. Sunstone Circuits is one of the leading suppliers of PC boards in North America, and has been a Screaming Circuits partner for six years. Engineers can now answer a few basic questions about their project, and upload a bill of material for an automated quote at any time of day, during any day of the week. The efficient web-based application is able to calculate the cost of fab and assembly, plus quote the parts listed on the bill of material – simplifying the process for each customer. Moreover, the new website allows customers to order with the greatest flexibility of lead times and quantities possible. Because Sunstone Quickturn PC boards can be fabbed in as little as one day, when combined with Screaming Circuits’ 24-hour turn, plus transit time – it allows for completed electronics assemblies to be shipped in as little as three days from the start of the job. “Agility and flexibility are what engineering teams and their production sourcing counterparts want. By providing an end-to-end solution which gives them a range of options, from fast online prototype ordering to full electronics contract manufacturing support, we provide them with the solutions they are looking for.” said Duane Benson, Screaming Circuits Marketing Manager.